ILLUMINATING the way to Brooklands Museum, the gateway’s majestic guardian was bathed in striking amethyst shades for the Purple Lights for Hope awareness initiative. 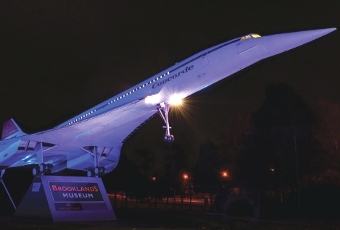 The 40 per cent scale model of the iconic Concorde that previously stood at the entrance to Heathrow Airport is usually lit up at night in white light, but on Thursday last week a powerful purple hue took over the view to mark the first ever World Pancreatic Cancer Day. Other UK landmarks bathed in the magical light included Trafalgar Square, Blackpool Tower and the Spinnaker Tower to remind people to remember those who have lost their battle with pancreatic cancer as well as to celebrate those who have survived. Pancreatic cancer has the lowest survival rate of all the 21 most common cancers in the UK, with only around four per cent of people diagnosed surviving five years or more. So Brooklands Museum were delighted to help out when resident Susan Speece approached them about the idea. She became involved with Pancreatic Cancer UK when her mother was diagnosed with the disease, and lost her battle to it. Susan progressively became more involved with the charity, first as a volunteer and subsequently working on the Purple Lights for Hope project. Majestically reaching for the skies in take-off position, Concorde was one of the most magnificent and recognisable aircraft ever to grace the skies. She is just one of the aircraft that forms an 80-year legacy of aviation manufacture, design and testing at the Brooklands site. GO to www.pancreaticcancer.org.uk to find your nearest Purple Lights for Hope event, to get involved, or for more information about the charity visit www.brooklandsmuseum.com.